Photo courtesy of the Buffalo History Museum. The International Railway Company (IRC) owned and operated Buffalo’s transit system prior to 1950. In 1930 the principal means of public transportation was the streetcar, of which 900 traveled along 415 miles of track—by comparison, the Metro Rail today runs along 6.4 miles. When the IRC began to dismantle the streetcar system in favor of “modern buses” in 1935, the cost-saving measure had to be promoted as progress. A step up, not a step down. 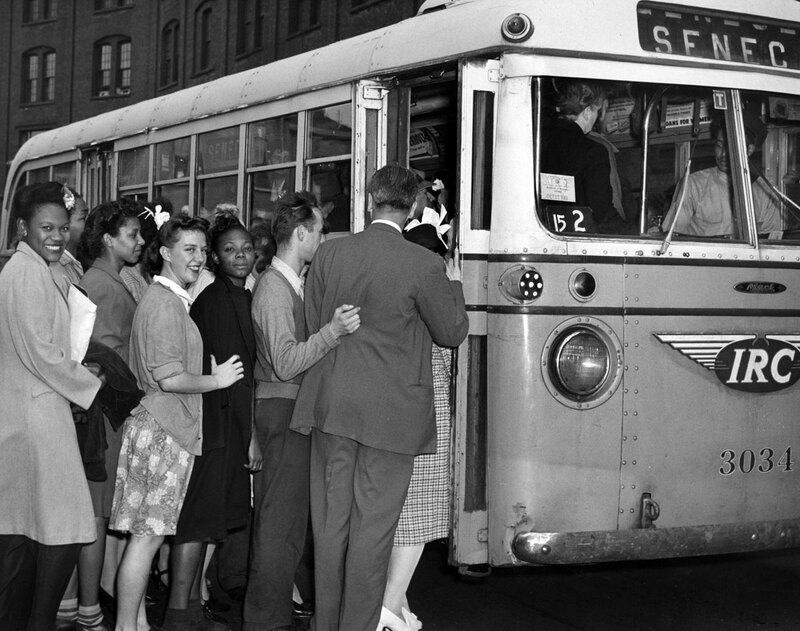 This IRC promotional photograph of happy transit riders boarding the new #15 Seneca bus is one example—in the background, the factory complex of the Larkin Company. The Seneca streetcar was ripped out in 1941.